So I’ve used MagpieRss for quite sometime. First used happened a few years back when I did a little work customising my own version of TorrentFlux. Someone back then introduced me to Magpie which proved much easier than using my own XML parser. Anyway since then it has been used in quite a few places to auto update sections of sites. One of the recent “bugs” I’ve come across is where it displays the message below from time to time. Anyway from the usual googling, there is more than one place that this type of message shows up. Annoying though is that this bug is fixed in the development version of Magpie and was actually fixed over two years ago. On a side note, WordPress needs a nice way to handle code windows. So being a long time Garmin fan (I’ve a Nuvi 670 in the car current, used to have a 350T before it got stolen, and have made numerous other people buy one, or two in the case of my parents), when it came time to get a new cycle computer and I found Garmin did them, it became an easy enough choice. Since I’ve a tendency to always buy the best one available, that only left the Edge 705 even though I know I’ll rarely use the maps on it. But maybe when the longer cycles start. The hardest thing to over come was the battery life. Honestly I don’t fancy having to take the computer off the bike and charge it but since it downloads to the pc, it’ll most likely get charged in work when it is downloading. I’ll report back on the battery life as I use it more but I can’t really see it matching my Cateye Tomo. Haven’t changed its batteries in years of use! From a recommendation (and because they were loads cheaper than everywhere else), I’ve purchased from handtec.co.uk. I will say now that they were impossible to contact by anything but phone. The online support kept timing out after saying someone will be there soon. Leaving messages on it got no reply. Emailing through the site got no reply. And emailing through Google Checkout got no reply. When I talked to someone over the phone I was told they had actually changed their shipping company and that is why I couldn’t track the item. Actually it turned out it hadn’t even shipped although they told Google it had. So much for quick turnarounds. Even though they told me it wasn’t going to ship until the Monday and to ring back then for a tracking number, it showed up at my work on the Monday with the first half of my bike order. So back to the topic at hand, the Garmin. I’ve chosen one with cadence and heart rate sensors since I do plan on doing some dedicated training with both cadence, and heart rate zones. 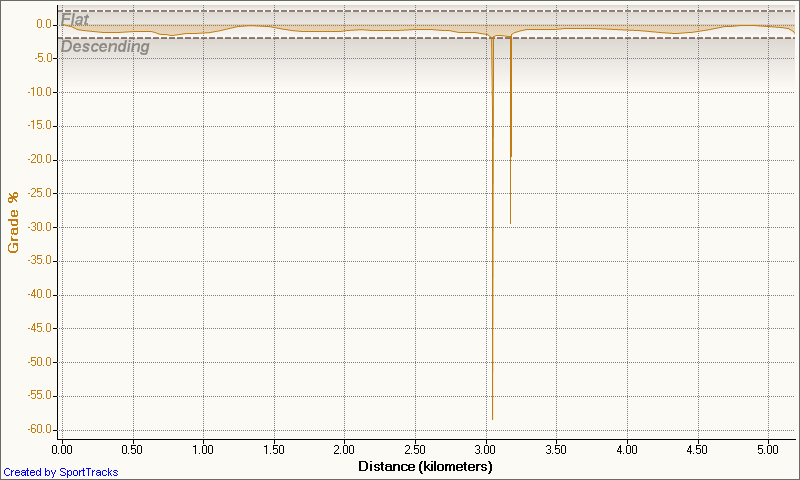 Around where I live there is a lovely long flat section of road that is perfect for interval training. The first major flaw that exists on this device is that you can’t turn it on in doors. Well you can but it’ll sit searching for satellites forever. None of my other Garmin’s have done this. Big problem with this is you can’t start adding in way-points or browsing features on the device. Obviously the use on a bike is a bit different than in a car but it’d still be nice to be able to turn on the device in doors and configure things up the way you want. The second major flaw is when charging from a pc. You don’t get a power/battery indicator. Where this has never been an issue with the models in the car (they have a power source there), on a bike you need full power. That would be an easy fix. Edit: Seems if you wait long enough, the Garmin does come up with a menu to allow you to use it with GPS turned off. It’d be nice to get this menu up without waiting. You can hit menu and get into the device menu itself so I guess that it enough for average things. The biggest annoyance we’ll call it is the maps. My device only came with base maps which I promptly changed to proper ones. (Garmin, if you are listening, please try make maps cheaper). Even with the new maps, it is a much different experience than you’ll be used to if you are a Garmin user. 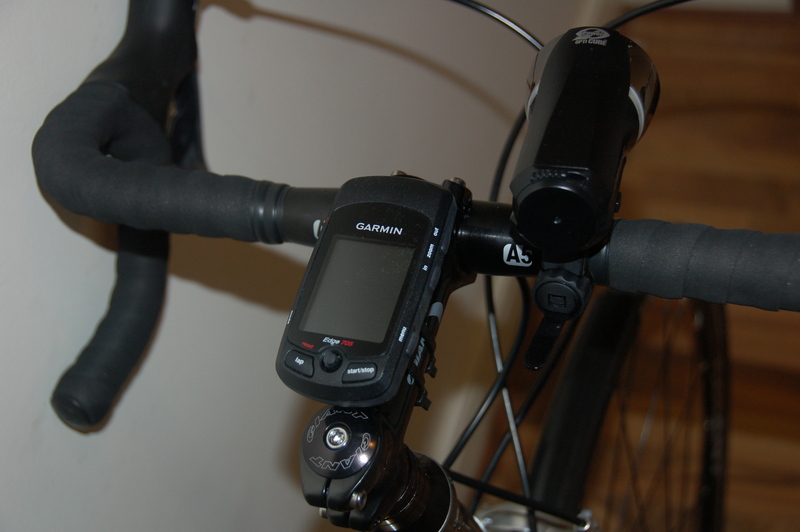 The screen isn’t full colour which isn’t really an issue, but the non 3D view is like an older Garmin and I do foresee if being confusing if and when I use this for navigation on the bike. Looking at it on the bike is detail free which is how you’d want it on a bike. When in a car you have more time to concentrate on the device where as on the bike there are more pressing things at hand. To the actual device. It does seem better built for outside use however I have my doubts as to how rain-proof it actually is. The side buttons are sealed but the joy stick and two top buttons aren’t. There are also two open holes on the back where the speaker is. Now I don’t expect the device to be usable underwater, but since everyone who cycles in the rain knows that it isn’t what comes down that makes you wet, it is what comes up, putting open holes on the back can’t be a good thing. Saying that there isn’t many reports of problems from my searches so time will tell how it works out. Edit: Seems that the stem blocks most of the dirt being thrown up. I do have mud guards but some is still making it and device is all ok. Still have to see what real rain will do. Some software usability issues. Setting the units to metric doesn’t take effect everywhere. Workouts for example will display in km if you choose it, but the drop down menus still show in miles and then convert back. Again, something easily fixed with a software update. 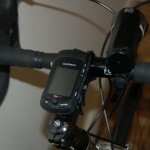 Viewing the device while on the bike is hard enough although admittedly that could be due to be getting used to the riding position on the road bike. Basically the device while sitting on the stem is a bit behind my head position and looking straight down is hard enough. When in a relaxed position on top of the drops, it is easy enough to read although having the back-light timeout adjustable would be nice. I’ve read in a few places that there is a way to make the back-light stay on all the time which is something I’ll be looking into. I’d also like the device to remember my back-light settings. 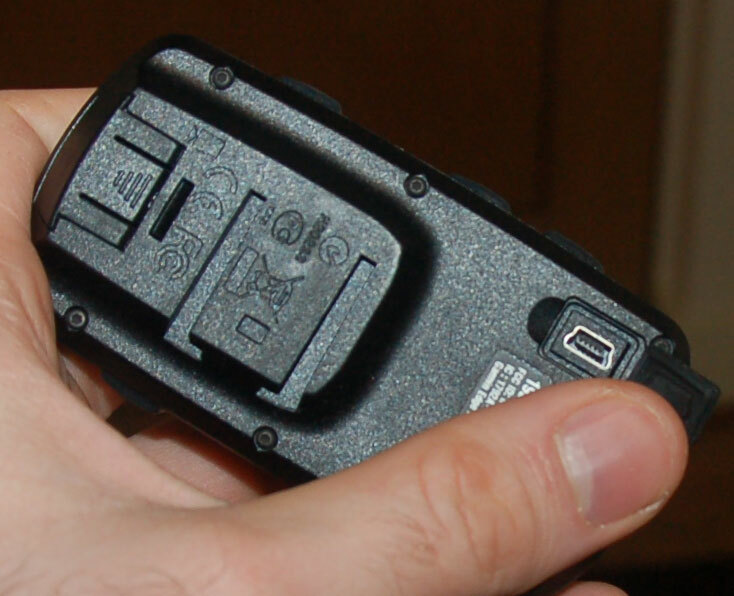 Basically you hit the power button then use the joy stick to change the back-light intensity. Works but turning the device on and off means it defaults back to completely off. The heart rate monitor works well too. Comfy enough to wear and stays put when riding. Strangely enough it doesn’t always kick in when I first put it on but soon as I jump in the saddle, it doesn’t miss a beat. Cadence picked up nicely as well and all of it logged to the device handy enough. Very useful to see how bad my technique actually is! I’m using SportTracks to log the information. It was recommended on a forum somewhere and has been working well for more than just logging details on the bike. The graphs and odometer are all handy features too. 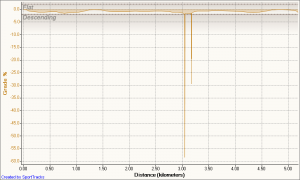 It did point out a few areas where the Garmin had the usual inaccuracies with logging data. As you can see from the image, it saw me drop down a huge amount and then back up again. Since these only seem to happen when I stop at corners, traffic lights etc, I can only assume the barometer is somehow open to the wind. Loading the data into SportTracks is simple too, hit import and in it goes. Attach my main bike to the ones I cycle and it’ll add the distance to it so I know when parts are due to reach the end of life. Anyway more will follow about the Garmin as I get some more usage on it. The virtual training partner is the big one that I want to try so hopefully sometime over the next week or two I’ll be out to race myself.